MEV Thinline Reference published by Passio, with the MEV ©2014 by Military Bible Association. 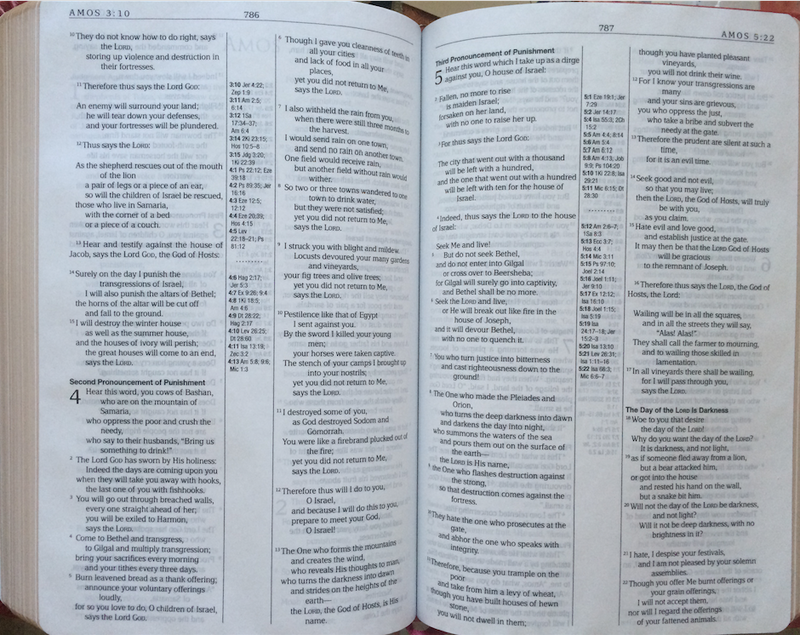 This is the first of two posts regarding the Modern English Version Bible. In this post I will examine the external issues (cover, typeface, paper, etc.) In the next post I will examine portions of the translation itself. The color is officially: Cranberry Leatherlike. The color is a blend between a true red and brown (photo shows it more brown than in real life). 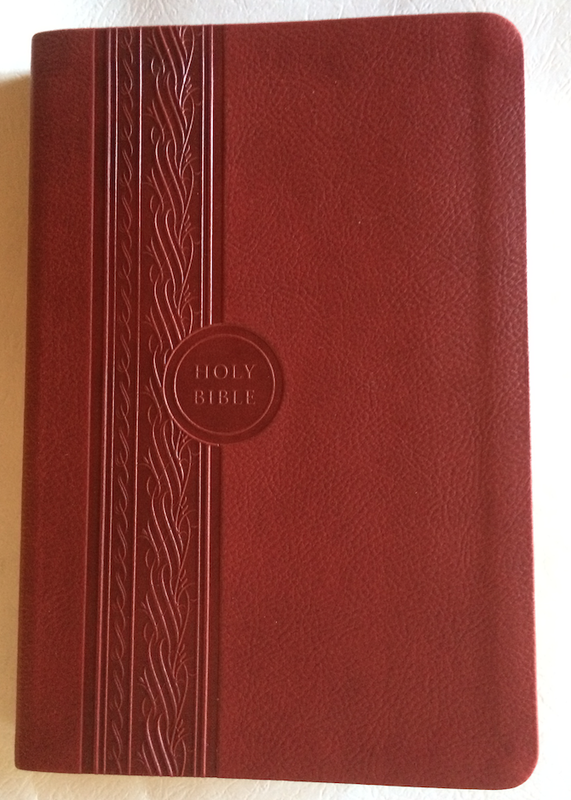 I like the color because it is unique among all my Bibles, easy to spot. The cover has a nice feel for a lower end synthetic product. The band shown on the left side is also on the back of the cover. When I first picked up it, the raised designed caused me to wonder whether that was a good decision (constantly feeling that design whenever you pick up the Bible to read). But after a few minutes, I didn’t really notice it, and the raised design wasn’t irritating as I originally expected. I have two concerns about the print: the print quality (and size) itself and paper quality. 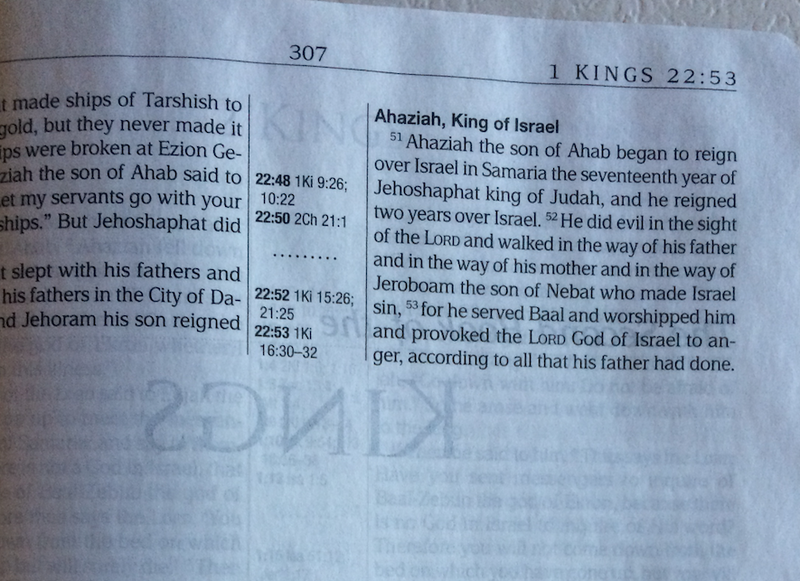 The print is small, even for a Thinline bible. The size works okay with the black text, but with the red text, it is distracting. 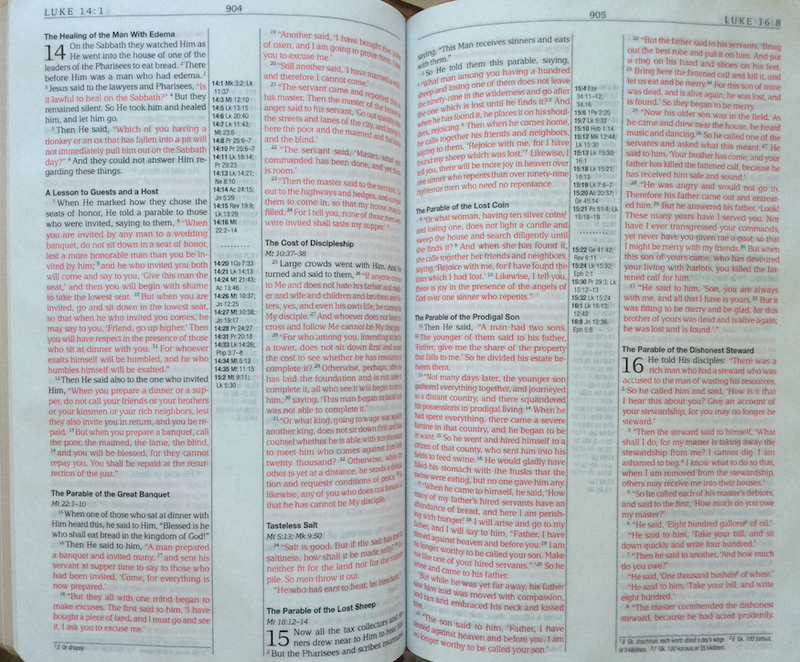 I am not a fan of red letter Bibles, but I own a few and have reviewed many more. I’m not sure if it is the typeface, font size, color of red used, or the paper weight, but I found this red letter text very difficult to read. My guess is that the typeface is acceptable, but the paper, and maybe the text color are the problem areas. 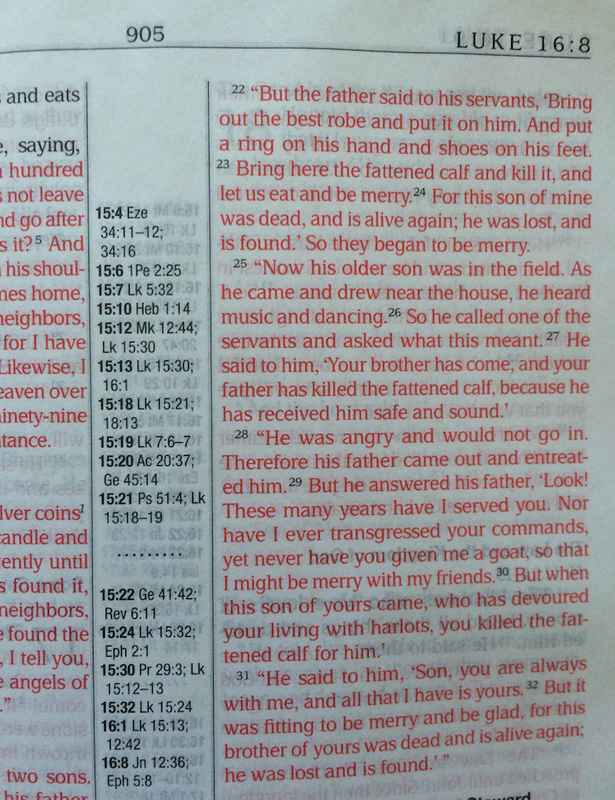 If I used this Bible publicly (teaching, preaching), it would be a challenge. Note on the close up of both the black text and red text photos, there is significant bleed-through, the black text is at least readable, the red text far less so. Surprisingly it looks better in the photo than it does in real life. But notice the dense bleed-through in the lower right corner, as well as the center column references. The cover is well done and feels comfortable. I like the typeface choice. A little larger font size and the difference in readability would be significant. A second factor is the paper weight choice. I realize this is a Thinline edition, but the bleed-through is the worst I have noticed in all Thinline Bibles I have reviewed/used.